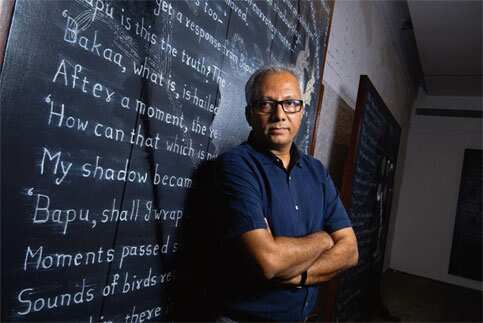 Artist Atul Dodiya’s 10,000 sq. ft studio in Ghatkopar, Mumbai, overlooking the Eastern Express Highway and the Thane Creek, is like a museum of his inspirations. Satyajit Ray, Jasper Johns, Bhupen Khakhar, Francois Truffaut, Mahatma Gandhi, his father, Bollywood villains, Joseph Beuys—the breadth of imagery, carefully juxtaposed, is staggering. Dodiya’s new show, Bako exists. Imagine, is a crystallization of this idea of assemblage and meaning-making. With these works—12 paintings in oil, acrylic and marble dust and an installation of nine wooden cabinets containing artworks and found objects—Dodiya returns to his childhood and teen years, when his influences were raw and unrealized. “This show is a celebration of my heroes and my growing up." My visit to his sprawling studio, the penthouse of an industrial complex in Ghatkopar, coincides with the day the works are being wrapped for transfer to the Chemould art gallery, which is hosting the exhibition. Dodiya used to work at his father’s home in the same neighbourhood until a few years ago; there, he said in an earlier interview to Lounge, neighbours constantly dropped by to give him their feedback—“some valuable and some not". From the old studio in a chawl, he envisioned and created works that looked outward to the city, to the history of Indian art, to artists he admired and later, very deeply, at Gandhi and at ideas of nationalism after the Gujarat riots, and chiselled the idiom for his hyper-referential art. Dodiya’s rootedness defines his relationship with the city and in fact, much of his art. In Orhan Pamuk’s Istanbul: Memories of a City, the narrator explains that unlike other writers whose exiles and mongrel existence have fed their imagination, he has thrived on his city and neighbourhood. “Mine, however, requires that I stay in the same city, on the same street, in the same house, gazing at the same view. Istanbul’s fate is my fate: I am attached to this city because it has made me who I am…." This passage by Pamuk could explain Dodiya’s inspired rootedness and the celebration of the universal in the local in his art. Ghatkopar, where Dodiya works, and has lived all his life, is a tumultuous suburb. Heavy goods trucks, autorickshaws, buses and private vehicles negotiate its narrow arteries, full of craters. It is home to small businesses and middle-class housing societies. Like many other suburbs in Mumbai, Ghatkopar is an India in the making—the city’s malaise juxtaposed with its will to live. Dodiya finds that it still inspires him. “It’s an India that interests me, it encompasses some of my quintessentially Indian concerns—the changing city, for example, the contrasts and the conflicts that exist in the city," Dodiya says. In the new show, ideas of nationalism and Mumbai’s transformation, which have engaged him ever since the late 1990s, are conspicuously absent. 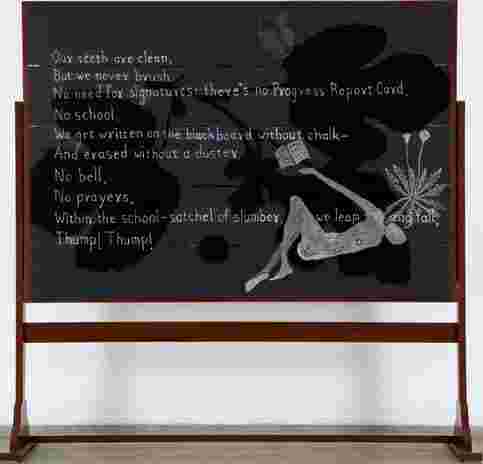 Words scribbled in white on a black canvas, some of which are mounted on wooden frames, resemble blackboards. The words could be written in chalk, except they are oil on canvas, rubbed on the edges to create an effect that looks like chalk smudged by a duster. On each canvas, occupying a secondary, corner position, are figures made with oil and marble dust. The words are English translations by Arundhathi Subramaniam and Naushil Mehta of a work of absurd fantasy, Bako Chhe Kalpo, by Gujarati author Labhshankar Thaker. “It is a work that has been with me for many years. The idea of a 10-year-old boy having a conversation with Gandhi, not about big ideas of nationhood or patriotism but of ordinary things, reminds me, personally, of a lost time," says Dodiya. All the 12 paintings are priced under Rs40 lakh, according to Chemould’s Shireen Gandhy. All of them are, observes Dodiya’s wife, artist Anju Dodiya, “a strange mix of the deeply personal and a literary fantasy with a humour that has always saved him from becoming obscure." The complexity that arises out of Dodiya’s referential breadth has often altered his readability for an international audience. He has chosen to remain rooted to India, Mumbai, even Gujarat. He keeps returning to the two-dimensional canvas. Dodiya has often reiterated that even his cabinets and shutters are against the backdrop of a wall, and that his vision is essentially that of a painter. Could that be why fame and attention in the global art market have seemingly eluded him? A Dodiya painting is not as directly and spectacularly about the idea of India as, say, the sculptures of Subodh Gupta or some of the politically charged and shock-inducing video installations of Shilpa Gupta. Class act: Thump Thump, a work from Atul Dodiya’s new show. Indian contemporary is not yet hot on the global art scene. In auctions, collectors still largely bet on the Progressives. But there are some names in exclusive catalogues and collections: Subodh Gupta, Ravinder Reddy, the Raqs Media Collective, A. Balasubramaniam and Shilpa Gupta. In contrast to the prices fetched by these artists (above Rs2 crore on an average in the past two years), the most expensive work by Dodiya sold at an auction was at a Sotheby’s auction in 2007—Father, a work in oil and acrylic, which sold for $601,000 (around Rs2.8 crore now). In May, at Saffronart’s summer online auction, Sabari Shaking Mondrian (2005) sold for Rs3.16 lakh. Between December 2009 and May this year, the highest price a work by Dodiya has fetched in any Saffronart auction, arguably the most important auction held within India, is Rs24.5 lakh for the 2005 work Stammer in the Shade, sold in February. Going just by numbers, Dodiya’s marketability worldwide is limited. But he has loyal, discerning collectors such as Mumbai-based Harsh Goenka and Delhi-based Nitin Bhayana. His works are in some important international collections, including that of the Philadelphia Museum of Art, and the Museum of Old and New Art (MONA), Australia. Paris-based gallerist and collector of Indian art Hervé Perdriolle says: “The multifaceted aspect of the work of Atul Dodiya is rich and dense. Where many contemporary artists simply develop just one facet of their research to a form of conspicuous repetition, Atul Dodiya does not hesitate to expand his research and themes… The extreme speed at which works are done, for runs at bienniales, exhibitions and fairs, leaves little time for analysis. But that takes time, the work of Atul Dodiya fascinates as much as he himself seems fascinated by his peers, from Mondrian to Khakhar through Beuys." Added to this dogged and lifelong involvement with his roots and Indian art history is his antiquated, almost Gandhian attitude to the forces of the market. The art market is never a comfortable topic with Dodiya. “I don’t think it’s possible to create art if you have a certain audience or perimeter for international success in mind. It is a huge constraint to creativity. I am never aware of this aspect of working," he says, slightly flustered, and eager to justify his position. In a recent article on Dodiya in Time Out magazine, curator and critic Girish Shahane writes how, eight years ago, Dodiya was on the cusp of gaining international attention by experimenting with assemblage and installation. Shahane writes, “Well-regarded displays in London, Yokohama and Madrid placed him on the brink of a serious breakthrough. However, he remained true to his love of painting, and kept going back to oils and watercolours. He took on the patently unfashionable subjects of marriage in a solo titled Saptapadi." Dodiya was born in 1959 to a Kathiawadi family living in Ghatkopar. His father was a civil contractor. The family watched films of Guru Dutt and listened to the music of Kumar Gandharva and other greats. “There is no doubt that we were all interested in the arts and that I was interested in painting since I was in school," says Dodiya. When he was in his early teens, his father bought him a first-class train pass to travel to south Mumbai, where art exhibitions were held. “In the early 1970s, through Doordarshan, I was educated in the cinema of Ray and Ritwik Ghatak, two big influences in my life, especially Ray. A few years later, I also saw films by Truffaut and other European masters. Bollywood was always there," says Dodiya, adding that cinema is a big part of his life and a way to understanding deeply human concerns. He says he wants to work on a video-based work because of this lifelong interest in film-making. 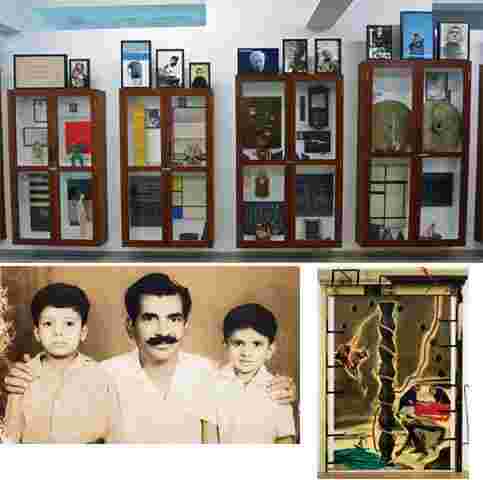 Flashback: (clockwise from left) Father, a work from 2002; Dodiya (extreme left) with his father Bachubhai Dodiya and brother Ajay; and part of Mediation with Open Eyes, an installation of nine cabinets at the new show. Two years after his first solo, Dodiya received a French government fellowship to spend a year in Paris. It was a time of anxiety and questioning, says Anju. “We would visit the Picasso Museum often; it was just a street away from where we were staying. Atul thought it was already a dead end for him because whatever was left to be done in art has been done, what else could he do? When we returned, his work changed." He began thinking bigger. He stayed with a strictly two-dimensional canvas; his themes became multidimensional. She says the Gujarat riots in 2002 were the other turning point, when Dodiya’s engagement with Gandhi and ideas about national identity became more urgent. Dodiya says, “I was brought up reading Gujarati literature and being a Gujarati has shaped who I am. So that event hit me hard. I was ashamed and hurt." Anju is a critic of his works, but they both say their artistic paths are different. “I shut myself up in a room to paint," says Anju, known for her stark and introspective self-portraits rich in textural details. “I think he continuously works at his art. While watching a debate on news television or watching an obscure Hema Malini film on his iPad. He is distracted and absorbed at the same time," Anju says. Their teenage daughter has recently joined an art school in Chicago. Young artists say the freedom inherent in Dodiya’s artistic process, the way art history, the concerns of his city, Indian society, politics, film and nationalism converge in his work, is an inspiration. It is a sign of a free mind more important than the free use of space. “I am a great admirer of Atul’s ability to bring in so many disparate things in his works and make the final product look meaningful," says 35-year-old Shilpa Gupta, who was a student at the Sir JJ School of Art when Dodiya presented his first solo. It is a spirit that also makes him the artist who captures Mumbai best, says Gyan Prakash, author of Mumbai Fables (the US edition of the book has Dodiya’s The Bombay Buccaneer as its cover). “He will take works of Magritte, Tyeb Mehta, and Bhupen Khakhar and incorporate them in his own art, giving them a different meaning. This aspect of assemblage and quotation allows Dodiya to constantly explore new materials and spaces, and gives his work a restless, open spirit. I find this aspect of his work in tune with Mumbai’s own history and character as a made-up, patched-together city. Not arising at the site of on old shrine or trade route, Mumbai, like Dodiya’s art, is not bound or weighed down." Kaleidoscopic representation of Indian art is almost always simplistic and naïve. It usually requires crutches of kitsch and overused exotica. Only in Dodiya’s oeuvre does a rigorous chronicle of India’s politics, icons, art history and pop culture emerge as one seamless narrative. He is the artist of an India we are constantly peeling. Bako exists. Imagine is on display at the Chemould Prescott Road gallery, Mumbai, till 20 October.